The last week of Term 3 some of the Year 8’s went to Anglesea camp. When first getting there, we went on a small walk around the area learning our way to the beach for the next day. We had planned on doing some activities, but the weather decided against that. The next day we got up early ready for the day ahead of us, we had breakfast and split up into two groups, the first group going horse riding and the second group doing the activities we had planned on doing the day before. When my group got to the horse-riding place, we got fitted in to our helmets waiting to be signed to the horses the ladies chose for us. During the ride we had to stop many times, like when one horse decided to take the route back to the horse-riding place. My group left smiling telling each other the funny things our horses did. When we got back we quickly got changed in to our bathers waiting for the bus to take us to the beach. When we arrived, the instructors fitted us in to our swim suits warning that putting them on would be a struggle. After getting changed we all met up getting a surf board laying down on them, we got old what to do and off we went in to the water. The next day we all relaxed packing up our things, waiting to be taken back to school. This year’s camp was definitely something to remember, thank you Ms Saxton, Ms Kukula, and Mr Esnouf for coming and supervising us through out the time. 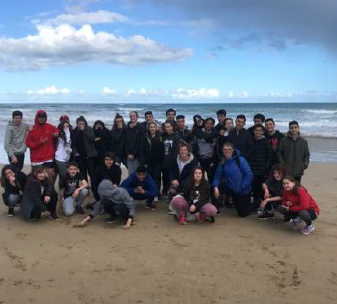 At the end of term 3, majority of the year 8’s went to camp in Anglesea. Though we went for only three days we made the best of it. We did fun activities including archery, low rope course, surfing and horse riding. The surfing was really fun at the beach. The highlight of the surfing activity was when the big waves came, and we tried getting on to the boards, but we’d always fall off. In my opinion horse riding was the best, because we got to ride up a mountain to a bridge and back down to the location where the horses were from. The reason I enjoyed horse riding was because we had the chance to control them ourselves. The breakfast on one of the mornings of camp was nice, we had pancakes with cereal and toast. Then for lunch we ate schnitzel in a roll and the following day we had a barbecue that was really yum! For dinner we had a delicious spaghetti Bolognese. In total the year 8 camp in Anglesea was great and fun! Thank you so much to Ms Saxton for organising this great camp and Ms Kukula, Mr Esnouf and Ms Saxton for coming with us. At Camp Anglesea all the year 8 students did fun and exciting activities. My favourite parts of the camp were surfing and horse riding. All the year 8 students enjoyed all the activities and all the games that were even inside the dining room. The games that were inside the dinning were: pool, table tennis, a soccer table and hockey table. In our free time we also had a beach volleyball tournament. I’d like to thank all the teachers that came on camp that made it more enjoyable and more fun.